I’m crazy for organic tomatoes – crazy for trying, crazy for crying…whoa sorry to go all Patsy Cline on you. 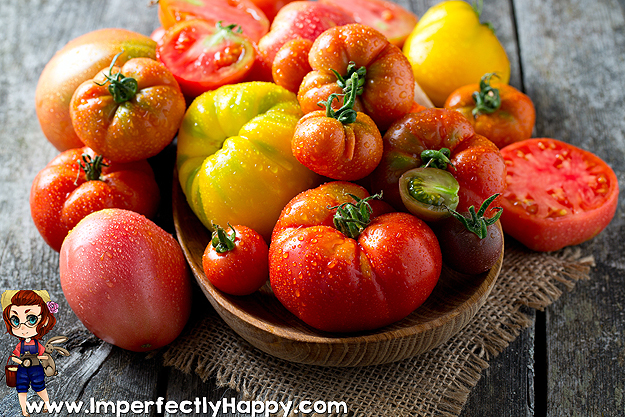 But, seriously, I love my organic tomatoes and I have 10 tips that will help your harvest whether you are a beginner or veteran gardener! Hey, if you have a tip I didn’t include please leave that in the comments…but remember, all organic please. Prepare your soil – in my opinion compost is KING for growing tomatoes. Tomatoes are heavy feeders and they love the nutrients that compost will offer. I use my special soil blend and grow in 10 gallon fabric pots to avoid root bound tomatoes. Find varieties that do well in your area – this is key. Talk to your local gardening friends or nursery about the varieties that do well in your climate. While I prefer heirloom organic tomatoes, I have found a couple of hybrids that do exceptionally well in my desert climate. Hybrids are not always organic, so check first. The best seeds are going to come from tomatoes where the plants have already grown in your area, so ask around and save yours! Choose a good location – in the desert I can’t put my tomatoes out where they’ll be in direct sun all day long. I have literally had sun brunt tomatoes! You’ll need good access to sun but how much will depend on how much heat you get during the growing season. Mine get great morning sun from about 6:00 – 11:00 am and a little indirect after that. But in the heat of the afternoon they are in the shade of my porch and they love it. It may take you a couple seasons to find just the right spot. Also be sure to choose a spot where they aren’t getting too much wind, you’ll be glad you did. Speaking of location – don’t grow your tomatoes where you just had your potatoes. Bad crop rotation juju folks…aka disease and pests. For more on crop rotation click here! Give them space to grow – don’t crowd your tomatoes. I follow the Square Foot Gardening recommendations of 1 plant for every 4 square feet, when I have them in raised beds. white fly away from your tomatoes’ succulent leaves. Garlic is another great companion and is known to repel aphids. 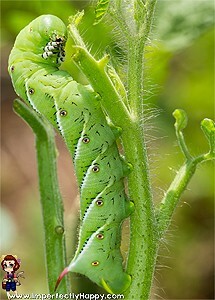 While planting Borage with your organic tomatoes can help protect them for the dreaded horn worm. See my article on companion planting for more information. Be consistent with your watering – some will tell you to water often but a little while others will tell you to water deep and not as often. I say consistency is the most important thing. Don’t let your soil get soggy or dry. Inconsistent watering can lead to blossom rot; and no one wants that. Mulch – I prefer to mulch around my organic tomatoes to keep the soil moist and weeds down (though growing in pots keeps most weeds out). Check out this article for some awesome ideas on mulching your tomatoes. Support your plants – tomato cages, canes and netting are all great for your organic tomatoes depending on the variety you’re growing. A healthy tomato plant is going to need the strength of an outside source or you’ll have fruit hanging low on the ground. Pinching and pruning – I’ll be honest, most of the time I just let my organic tomatoes go wild. I don’t do a lot of the pinching and pruning that most gardeners do; and I always get a good healthy harvest. But pinching off suckers (the sprouts that pop up in the middle of two branches) can help your plants use nutrients and energy more efficiently. Pruning yellowing leaves are also a good idea for the overall health of the plant. If you’re looking for a great way to preserve some of your extra tomatoes, you have to try making Tomato Powder! I found it interesting that you would need to find the right type of tomato that would grow well in your area. Knowing that your plant will grow well can give you more time to care for your organic tomatoes. When I start my garden each year, I like to add a layer of good potting mix that will help the new plants grow the best. 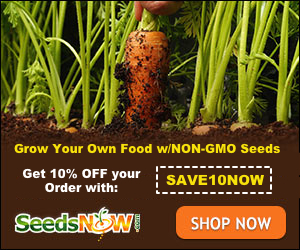 I love having home grown organic food so I will definitely be sure to check out more ways to safely grow my garden.